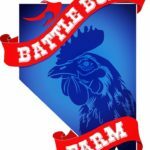 Chickens – Beating the Heat! Chickens can become very stressed with sudden increases in temperatures and it stimulates blood flow to move away from vital organs and toward other areas of their body, such as, their combs, wattles and skin, thus making them more susceptible to heat stroke. Chickens cannot sweat—they cool themselves by dunking their beaks in cold water or flapping their wings to air out their feathers. They may also pant when they are desperate to cool down. Given that a chicken’s body temperature is 107° F, it is no wonder why they prefer such cooler temperatures. Typically, their body’s first reaction to heat is panting which helps them keep cool, but increases their respiratory and heart rate, as a result. This leads to expelling carbon dioxide at a much faster rate than normal which upsets the pH balance in their bodies and can lead to acidosis, a potentially fatal condition. Consistently high summer temperatures can cause your chickens to suffer from heat stress, overheating, or even stop their egg laying process. Some breeds of chicken cope better than others in the heat (Black Minorcas do really well), however when the temperatures get up and over the 80 Fahrenheit mark, any breed of chicken will start to suffer. Eating little amounts of food. Large bodied, heavy breeds like Orpingtons, Wyandottes and Australorps are especially at risk in high heat. If you see your bird is in distress and lethargic or unresponsive, immediately put their feet in water or put water on their comb to bring down their body temperature. The first and easiest thing you can do is to sort their water supply out. 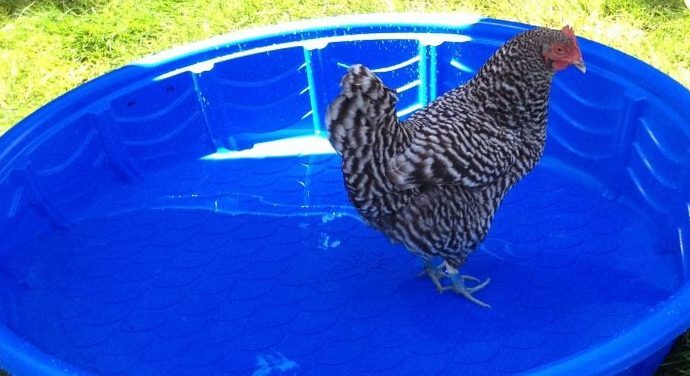 The cold water will regulate the chicken’s body temperature and keep them cool. During heat waves replace their drinker with several shallow dishes. Scatter these dishes throughout the pen and in the shade so the girls are always near water. The shallow dishes are also much easier to refill throughout the day to keep the water cool. Add ice cubes throughout the day. 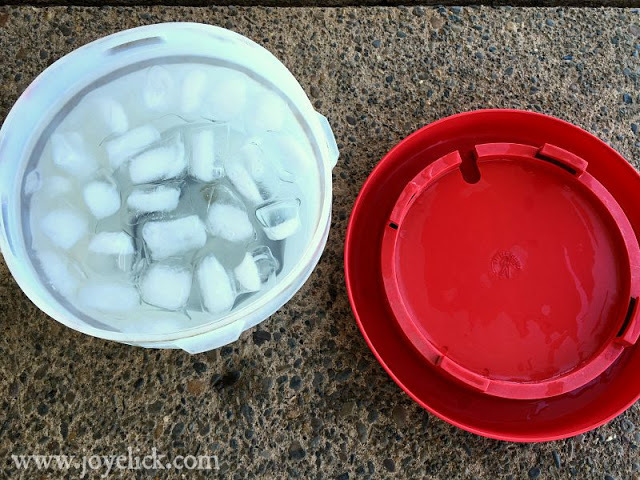 If you are using a large drinker/bucket add a frozen bottle of water to cool down the water. Change out their water at least daily (multiple times a day in super hot weather). Mint can also help lower body temperature, so adding some fresh, crushed mint leaves to your chicken’s water is a great idea! Once you’ve sorted their water supply out the second best thing you can is feed them cold or frozen food. Chickens love: bananas, blueberries, watermelons, apples and strawberries. You can get frozen fruit by the bag if you can’t get fresh. Take these fruits, chop them into small pieces and freeze them. 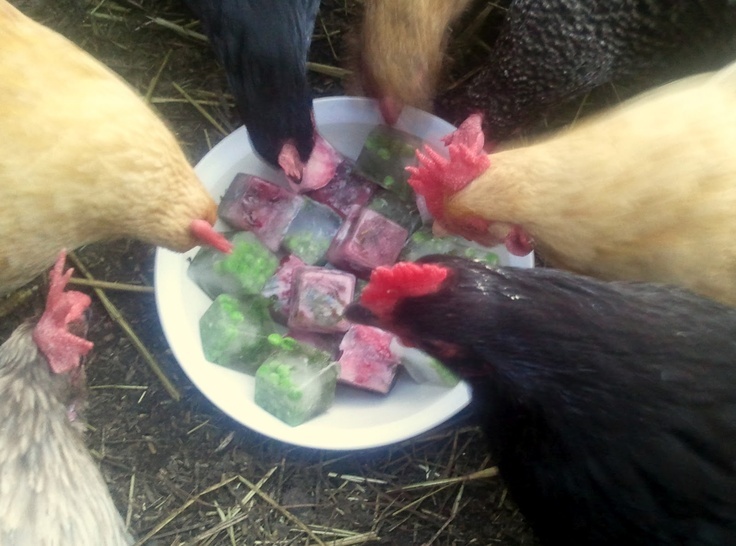 It should only take a couple of hours until they are frozen then you can feed them straight to your chickens. Note of caution: make sure to remove the seeds from apples as they are poisonous. Another favourite of some chickens is yogurt mixed with fruit. Feed them plain Greek yogurt and place some frozen fruit inside it. Just dump this yogurt out into their trough and watch them go crazy! As well as feeding them the right food you need to make sure not to feed them the wrong food during a heatwave. Don’t feed them maize (diced corn) or scratch as this takes them a long time to digest and causes their body temperature to rise. If the only shade is the coop for your chickens you will need to create some areas. Use free-standing umbrellas for shade at either end of their run or areas they graze. 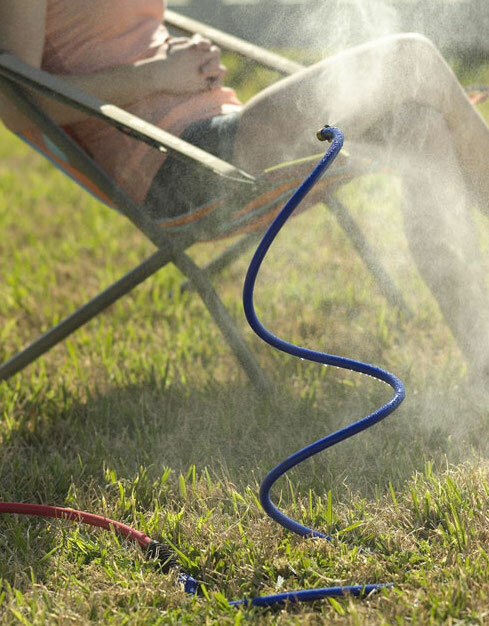 You can always get a misting attachment for your hose and leave this on during the day. Once you put the attachment on your hose just hang it down off either a tree branch or the top of your pen. To keep your chicken coop cool you need to allow for ventilation. 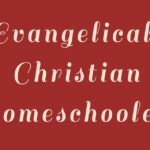 The simplest way to do this is to fit a window or opening with hardware cloth covering into your coop and leave the window slightly open when they go to roost. This will give your chickens nice cool air throughout the night. Another great way to reduce the temperature is to install a fan in their coop and run it during the daytime. This helps keep the coop cool so it isn’t hot when they go to roost in the evening. Finally, make sure you only have a very thin layer of bedding (sawdust) down on the floor of the coop. if you have too much chicken bedding inside your coop during the summer, it will act as an insulator and keep some heat inside the coop. 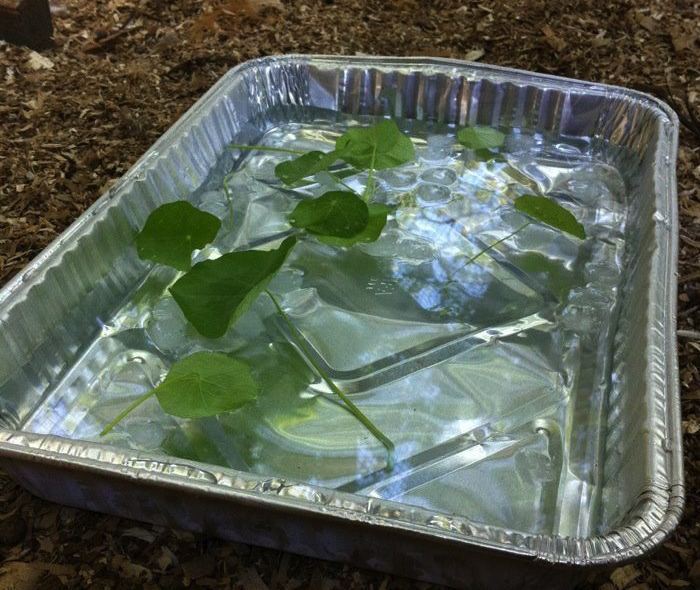 Instead of using the misting method above, you can use the blue baby pool and fill this with ice cold water. If you really want to make the water chilly you can place ice cubes into the water. On a hot day you will find after a few hours the water inside the pool will heat up and need replacing. We’d recommend only using the baby pool once a day during early afternoon when the temperature spikes. 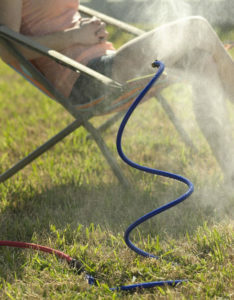 Spray a shaded area of dirt with the water hose and break it up with a shovel. Your chickens will scratch at the mud and lose some a bit of heat through their feet that way. As well, they may enjoy a luxurious mud bathe! Interaction with your chickens causes them to be more active and create more heat. On extremely hot days, try to leave your chickens alone and only check on them as necessary. If you don’t have a spare baby pool, you can always make you own portable frozen water bottles. Take a spare gallon milk jug and fill this up with water then freeze it. 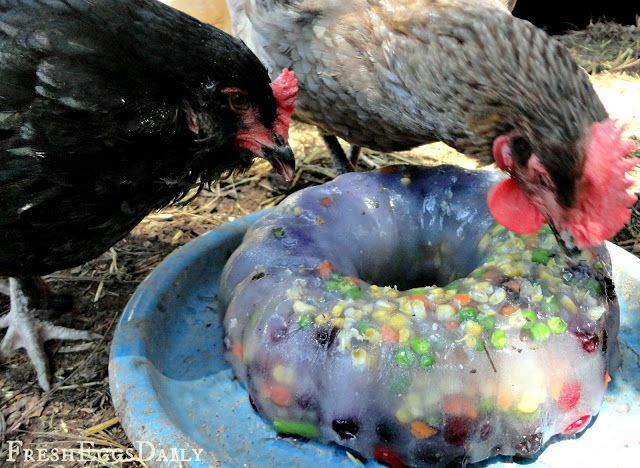 Once it’s frozen solid, take it to your chicken pen and slightly bury it in their favorite dusting places. 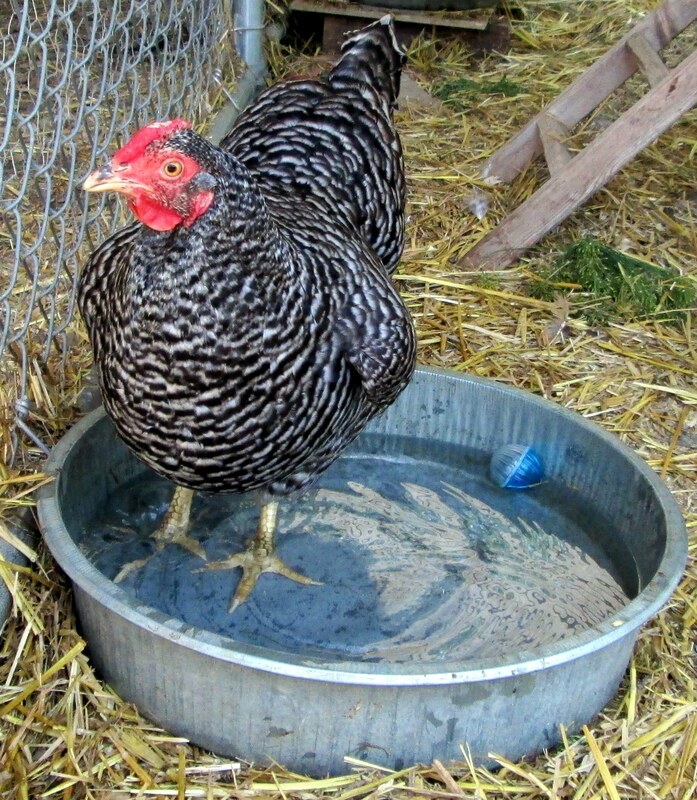 Place a small towel over the jug then let your chickens perch on top of the jug and cool down. For added effect make sure to bury the jug in shade. Add some apple cider vinegar to their water. Natural remedy can be your livestock’s favorite too. By adding ACV to your livestock’s water several times a week, it has health benefits and also increases calcium absorption, which is especially important during the summer months, when the hens’ feed intake goes down and they aren’t ingesting as much calcium as they normally do.